Trolling for new menu ideas for fall and winter parties? Look no further than the grill masters of Japan. Trending now among American chefs is yakitori. The word literally means “grilled chicken,” but the simple name doesn’t begin to describe the variety, complexity, and deep cultural significance of Japan’s favorite grilled meat. 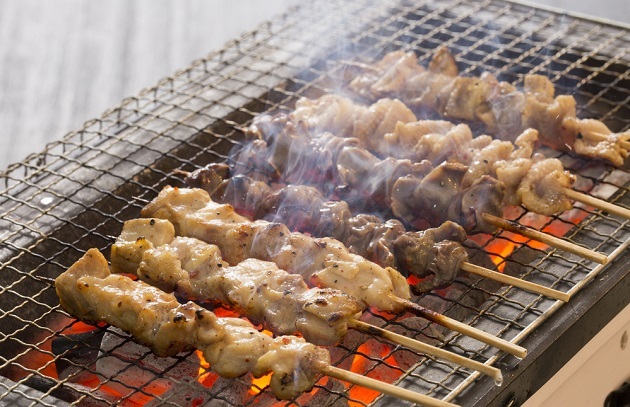 These small but elegant skewers (chicken, usually, but other meats and vegetables, too) are the epitome of Japanese barbecue, and some of the best in Asian fast food. In fact, they are very similar to Indonesian sates, but are usually prepared without rubs or marinades. In a diminutive example of snout to tail eating (beak to tail? ), nearly every part of the bird is utilized, from the skin to that prized nugget of meat just above the tail feathers, the oyster. (There are two per chicken.) Of course, you can use breasts, thighs, wings, and leg meat when making yakitori at home. Yakitori parlors dot Japan’s gastronomic landscape, ranging from noisy holes-in-the-wall where commuters can grab a quick snack and a few beers before embarking on the long trip home, to local neighborhood hangouts where local singles might come for dinner several times a week, to small but exclusive restaurants where a seat at the counter around the grill is as hard to come by as a ticket to a Springsteen concert. One of the most well-known yakitori parlors is Birdland, named for New York’s iconic jazz club, in Tokyo’s Ginza district—specifically, at the Ginza stop of the Tokyo Metro. Its famously temperamental chef-owner, Toshihiro Wada, has been known to refuse to serve customers he doesn’t believe are sophisticated enough to appreciate his distinctive style of grilling or who might recoil when served medium-rare chicken. During one visit, a fellow diner described him as otaku, meaning “very fussy,” or less politely, a PITA—an acronym I trust won’t get lost in translation. The grill yakitori is traditionally cooked on is a rectangular clay box approximately two feet long and just a few inches wide with a wire grid as a grate—the perfect size for cooking small kebabs without burning the exposed part of the bamboo skewers. (Below, see a unit we used at a recent session of Barbecue University.) But they can be cooked on a conventional charcoal or gas grill—especially a tabletop hibachi. Clean-burning binchotan charcoal is the fuel of choice, but high-quality natural lump charcoal will work, too. 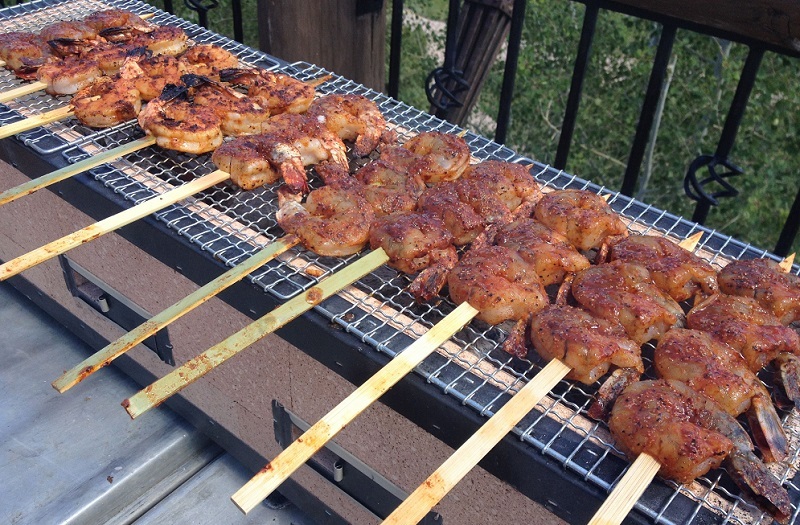 The skewers can be cooked on limited grill space. To get you started, here’s one of my favorite yakitori recipes.